Tender chunks of beef with potatoes, carrots and bacon make a hearty stew that's served with a side of sauteed cabbage to celebrate St. Paddy's Day. 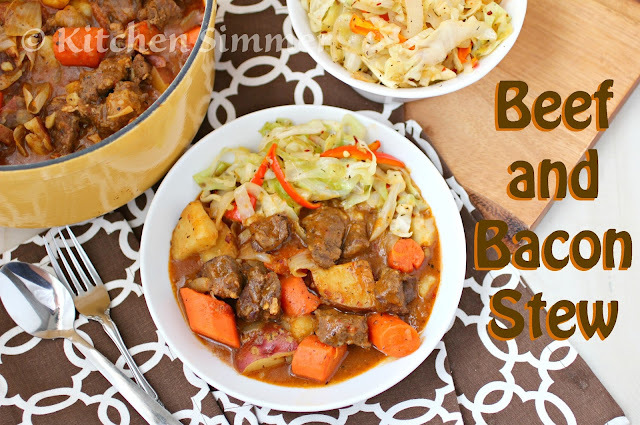 Beef Stew is always a hearty and much loved dish in our house. I love that you can make it with inexpensive stew (chuck) meat so it's also budget friendly. I usually make beef stew in my slow cooker, but I did not have time to make this stew slow today. I needed it done in about an hour and that's exactly how long this took to cook. My beef still turned out soft and tender and everything was seasoned so well. I may actually prefer the depth of flavor in my stove top beef stew better than the slow cooker version. On the other hand, I still love how easy the slow cooker version is because you can simply set it and forget about it until it's time to eat. 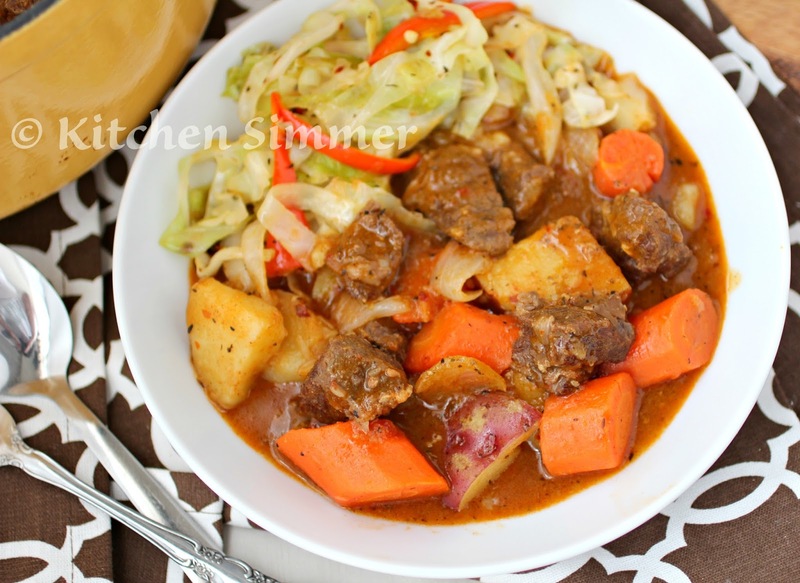 I wanted to customize this stew for St. Paddy's Day so I decided to serve it with a side of sauteed cabbage. I adore cabbage and I love that it's on sale during this time of the year. I bought it for about 29cents a pound! You may see more cabbage dishes here on the blog soon because I bought a lot of it since I cannot resist a sale. It's a good thing that cabbage lasts in the fridge for a while. I simply sauteed the cabbage in some of the bacon grease leftover from browning my bacon; nothing went to waste today. 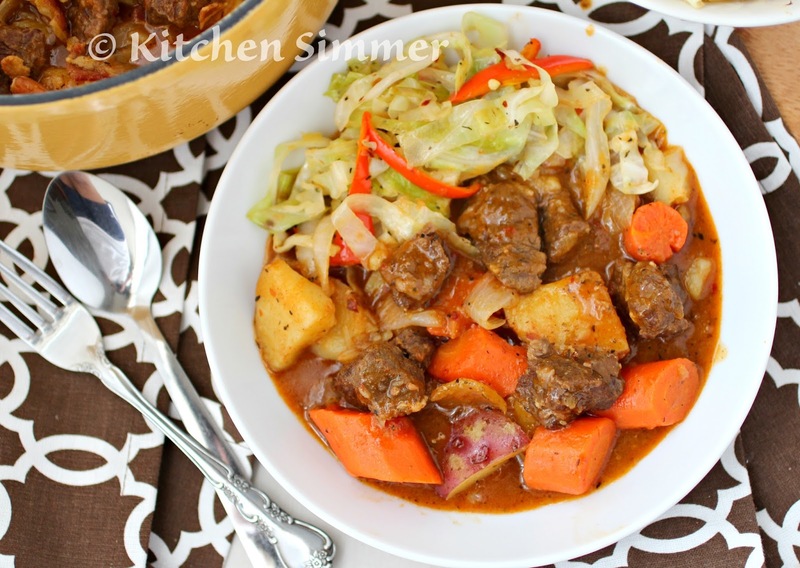 The sauteed cabbage really complimented the stew. This is a meal not just for St. Paddy's Day, but it's a delicious meal any time you want something hearty and comforting to enjoy. Step 1: Cut beef and season with salt and black pepper to taste then dust with flour. Leave on counter for at least 30 minutes to bring to room temperature before cooking. Step 2: Chop bacon. Then add it to a large dutch oven style pan on medium high heat and cook until it starts to brown, but not get crispy. Remove bacon grease from pot and reserve for later, but leave 3 Tbs worth in the pot to brown the beef. Step 3: Add the seasoned beef to the bacon grease and brown well. Then season with garlic, paprika, thyme, poultry seasoning and red chili flakes. Cook for 1-2 minutes with spices. Step 4: Add the 11/2 cups chicken stock (or 11/2 cups water) and turn heat down to medium. Put a lid on the pot and cook beef with spices for 30 minutes. Stir once halfway through cooking to make sure you have enough liquid. If needed, add another 1/2 cup to cook the beef. Taste test a piece of beef, it should be tender, but still slightly chewy at this point. Step 5: Chop the onions, potatoes and carrots. I used red potatoes and kept the skin on, or use a regular brown potato and peel them first. Step 6: Add the chopped vegetables and 2 cups of water into the pot after the beef has cooked for 30 minutes. Taste the cooking liquid and see if it has enough seasoning of salt and spice. Note: the potatoes will absorb some of the salt. Then place the lid on the pot and cook for another 30 minutes. Once the final 30 minutes are up, taste your beef again, the beef should be very tender and the carrots and potatoes should also cooked through. If the beef is still not tender enough or the potatoes are not cooked through, cook a little. Heat a large skillet with the reserved bacon grease. Then place the cabbage in skillet and allow it to sit for a minute start browning the cabbage. Then sautee the cabbage. 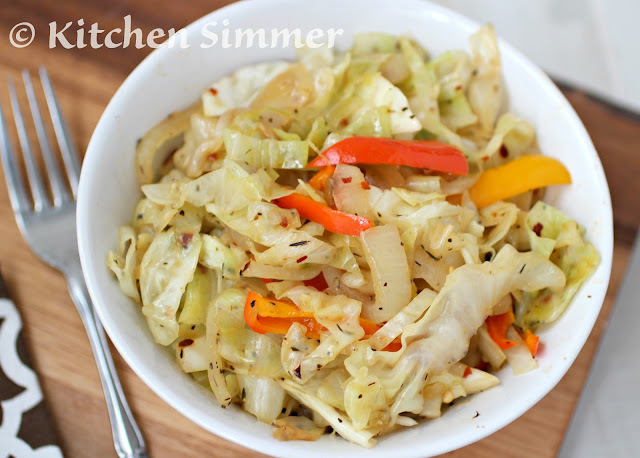 Once cabbage starts to soften, add the pepper strips. Next season with salt, black pepper, red chili flakes, garlic, and thyme. Saute for 8-10 minutes, constantly tossing the cabbage and ingredients in pan until it is cooked through. Taste for salt and seasoning. Serve with stew. Oh my this certainly is my kind of meal! I am one of those few people who just adores cabbage! Great dish Ramona, can't believe how quickly it cooked! I have an oven beef stew that cooks for two hours and I thought that was fast! HA. The cabbage is a great accompaniment on St. Patrick's, or any day! This looks amazing, I love that there is bacon in it. So much flavor! What a combination! This sounds so good! I agree- sometimes stove top is way more flavorful - but that slow cooker is indeed so much more convenient! BTW - this is one heck of a stew you have - all the flavors of the beef and bacon alone is intoxicating! Yes, yes, yes to adding cabbage to this recipe. This is a dish we would eat year round.